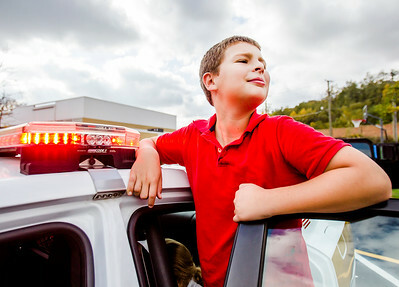 Sarah Nader - snader@shawmedia.com Anthony Savage, 9, of Algonquin checks out a police car during class at St. John's School in Algonquin Tuesday, Oct. 18, 2016. St. John's hosted law enforcement and fire officials from surrounding towns at the school to show their appreciation for then and also teach students about them. Sarah Nader - snader@shawmedia.com Mckenzie Olofson (left), 10, of Lake in the Hills and Makayla McCoy, 12 of Lake in the Hills reacts after getting locked in a police car during class at St. John's School in Algonquin Tuesday, Oct. 18, 2016. St. John's hosted law enforcement and fire officials from surrounding towns at the school to show their appreciation for then and also teach students about them. 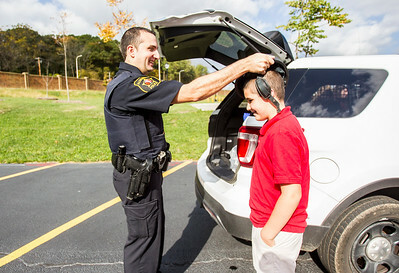 Sarah Nader - snader@shawmedia.com Police officer Jeff Diamone (left) lets Charlie Aversano, 10, of Crystal Lake try on a police helmet during class at St. John's School in Algonquin Tuesday, Oct. 18, 2016. St. John's hosted law enforcement and fire officials from surrounding towns at the school to show their appreciation for then and also teach students about them. 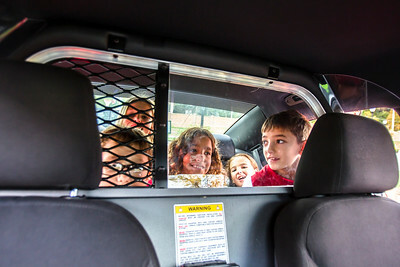 Sarah Nader - snader@shawmedia.com Students check out the inside of a police car during class at St. John's School in Algonquin Tuesday, Oct. 18, 2016. St. John's hosted law enforcement and fire officials from surrounding towns at the school to show their appreciation for then and also teach students about them. Sarah Nader - snader@shawmedia.com Leila Jolley, 8, of Algonquin checks out the inside of a police car during class at St. John's School in Algonquin Tuesday, Oct. 18, 2016. St. John's hosted law enforcement and fire officials from surrounding towns at the school to show their appreciation for then and also teach students about them. Sarah Nader - snader@shawmedia.com McHenry County Sheriff's Deputy Aimee Knop (right) show students the inside of a police car at St. John's School in Algonquin Tuesday, Oct. 18, 2016. St. John's hosted law enforcement and fire officials from surrounding towns at the school to show their appreciation for then and also teach students about them. 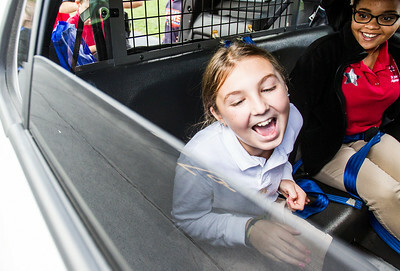 McHenry County Sheriff's Deputy Aimee Knop (right) show students the inside of a police car at St. John's School in Algonquin Tuesday, Oct. 18, 2016. St. John's hosted law enforcement and fire officials from surrounding towns at the school to show their appreciation for then and also teach students about them.